Fantastic? Incredible? I’d say that The Amazing Spiderman truly lives up to its name. Besides earning points for best Stan Lee cameo ever, The Amazing Spiderman takes the cake as best Marvel based film of the year, beating the thoroughly enjoyable MIB 3 and the mildly disappointing Marvel’s The Avengers. It turns out Marc Webb wasn’t just chosen for his name. His sensibility brought Spidey to life in the best vision ever shown, live action or animated. Borrowing heavily from Chris Nolan’s take on the Dark Knight while retaining Sam Raimi’s horror and comedic influence, Webb created a world for spiderman that is genuine and exciting. 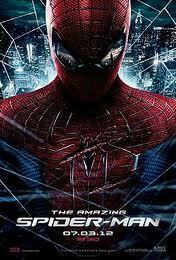 Andrew Garfield matches him bringing everything to the table to creat the perfect Spiderman. Add to him, the gifted cast including Emma Stone, Martin Sheen, Sally Field, and Denis Leary and inspired staging and visual effects and you’ve got more than a blockbuster. It’s a true classic. In this take, which retells Spiderman’s origin, Peter Parker wants to know why his father, a secretive scientist mysteriously disappeared. In the process of investigating the matter, he comes in contact with some of his father’s life’s work, a radioactive spider. gene splicing is researched in the lab to find a way to use the advantages of certain animals to heal humans. Dr. Conner, a former colleague of Peters Dad hopes to use reptile DNA to regenerate his lost forearm… but something goes terribly wrong. Peter’s character is much more complex and satisfying this time around, making both good and bad choices, while remaining true to his perspective as a teen with a lot of questions.